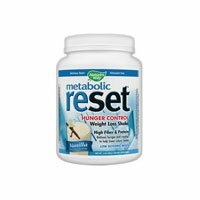 As par of a healthy diet and exercise plan, metabolic reset addresses both the glycemic and caloric causes of weight gain. Weight gain is often caused by the body’s response to reacting high systemic index foods (rich in simple carbohydrates or sugars). The results can be periods of intense hunger that lead to excessive calorie consumption. This is known as the “glycemic” cause of weight gain. Creates a feeling a fullness* – Metabolic ReSet expands in the digestive tract, resulting in a prolonged sense of fullness. * By avoiding feeling of hunger, you can comfortably eat less food, less often, and consume fewer calories.